Renal failure means that the kidneys aren’t working properly. If the renal failure is chronic, it is lasting and kidney function is unlikely to improve. However you can remain quite well until late on in chronic renal failure. It is therefore important to stop it from getting worse, if at all possible. ‘Chronic renal failure’ is often shortened to CRF. CKD, which stands for for ‘Chronic kidney disease’, means the same thing. 1 How do you know about chronic renal failure (CKD)? 3 Can end-stage renal failure be prevented? 5 What do kidneys do? 6 What treatment is required? 9 Is there anything else that I should do or not do? 10 Which patients with CKD should see a kidney specialist? How do you know about chronic renal failure (CKD)? As many people with chronic renal failure have no symptoms, it is often only diagnosed after blood tests. As your kidney function deteriorates, you might develop any of the following symptoms: poor appetite, nausea and vomiting, tiredness, fluid retention (swollen ankles or shortness of breath), itch, cramps, or restless legs. However there can be other explanations for most of these symptoms, and they are usually only a problem in severe kidney failure. For some reason, once kidneys have been damaged, they may continue to get worse over months and years, even long after the disease that caused the damage has gone. This is more likely if you have high blood pressure, and if there is much protein leaking into the urine. Renal failure that requires dialysis or a kidney transplant to keep you alive is known as end stage renal failure, or ESRF. You can monitor how your kidneys are doing by following eGFR results, or by using a ‘reciprocal creatinine’ chart. 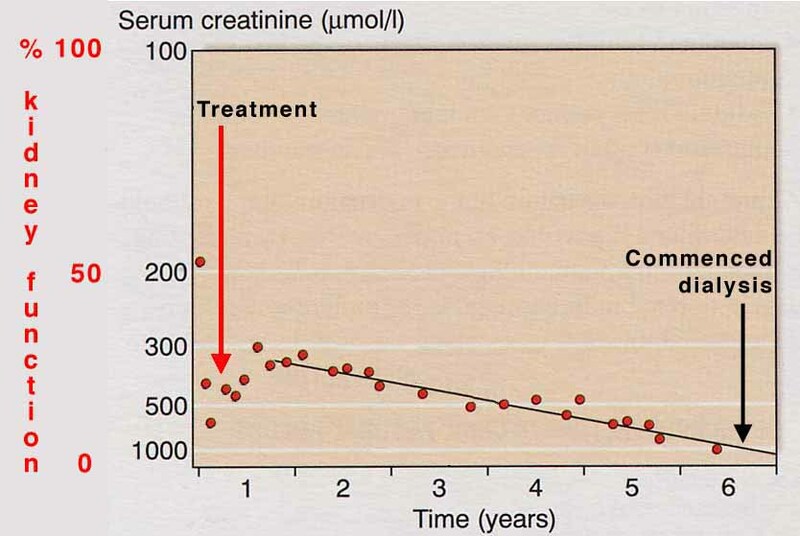 The graph shows a patient's kidney function over several years. His kidney function was severely damaged at first, but with treatment improved to about 30% of normal, so that he was quite well. Unfortunately over the next 5 years his damaged kidneys slowly deteriorated, so that eventually he needed dialysis. This is a 'reciprocal creatinine' chart, which can help to show how things are going. Download a blank reciprocal creatinine chart on which you can fill in your own results. Several blood test results over months or longer are needed to make the graph useful. The chart was made by Dr Richard Phelps. Can end-stage renal failure be prevented? Diet – This is more controversial and the risks and benefits need careful analysis. See what treatment is required below for more information about these. Classification of CKD is based on your GFR – glomerular filtration rate. This can be measured, or predicted from your age, weight, blood tests etc. More information about tests of kidney function. Mildly reduced kidney function, urine or other abnormalities point to kidney disease Blood pressure control, monitoring, find out why. Moderately reduced kidney function More of the above, and probably diagnosis, if not already made. Severely reduced kidney function Planning for endstage renal failure – more info. Very severe, or endstage kidney failure (sometimes call established renal failure) See treatment choices for endstage renal failure. Stage 2 kidney disease is a tricky area, because normal GFR falls with age, and therefore many normal older people may fall into this category. Equations used to predict GFR (rather than real measurements) may also give falsely low results in some people with near-normal function. Are at increased risk of getting heart disease or other illnesses affecting arteries. It is known that you can reduce both of these risks by careful monitoring and treatment. This page includes information about this and is particularly relevant to stages 2-4. The different diseases that can cause kidney failure may also influence what are the best treatments for you. Some kidney diseases require specific treatment that will help that particular problem. Here we are describing general treatment that may be required for anyone with failing kidneys, whatever the cause. You may have to follow a fluid restriction or have to take ‘water tablets’ (diuretics, for example Frusemide), and to restrict salt intake. This is to prevent fluid overload which can cause troublesome symptoms such as swollen ankles or shortness of breath. Your doctor may give you a ‘target’ or ‘ideal’ weight (also called dry weight). Occasionally people have the opposite problem, and need to take extra fluid and salt. Most people will have to take medication to control blood pressure. Excellent blood pressure control has been shown to slow down the progression of chronic renal failure, in addition to the benefits to the heart and blood vessels elsewhere in the body. Different medicines suit different people, but often an ACE inhibitor (or a similar drug) will be recommended, as these are particularly good for kidney diseases. Your doctors will advise you about this (and see separate information on high blood pressure in kidney disease). The anaemia that goes with renal failure is mainly due to a deficiency of a hormone called erythropoietin (Epo). Epo is produced by the kidney to stimulate red blood cell production from the bone marrow. A deficiency of Epo leads to anaemia. Often the anaemia of renal failure can be helped by taking iron. Some people remain short of iron even when taking iron tablets. If so, you might need a course of intravenous iron injections. This is usually done at the hospital as an out patient. With more severe anaemia you may be prescribed Epo, which has to be given as injections, usually once or twice a week. You can learn to give this to yourself quite easily. Alfacalcidol or calcitriol: these are active forms of Vitamin D, which is often short in renal failure, as the kidneys fail to process it. Phosphate binders (eg Phosex, Calcichew, Calcium 500, Renagel, Fosrenol) help to prevent too much absorption of phosphate from the gut and thus keep the level in the blood lower. Your diet may also help with this. At early stages of kidney disease (up to stage 3 and most patients at stage 4), the best usual advice is to eat a healthy, varied diet. keep salt intake down. It affects blood pressure. do not eat excessive amounts of protein. Don’t use protein supplements unless a renal dietician suggests you need them. Don’t take supplements for gym/training purposes. At later stages of kidney disease (stage 5, some on stage 4) you may be asked to follow a special diet in which there may be controlled amounts of protein, salt, phosphate, and potassium. You may not need to restrict all of these, and recommendations are likely to change with time. It is also important to avoid under-feeding. This is why the dietitian is an important member of the renal team. Separate information on diet is available, click here to go to the Diet pages. In renal failure the kidneys are unable to excrete the normal acid waste products of the body. People in renal failure often have too much acid in the blood (acidaemia) and have to take bicarbonate tablets to neutralise this. People with kidney disease are at greatly increased risk of heart disease, stroke and problems with the circulation. It is particularly important that you should not smoke as this increases the risk of heart disease even further. You should also attempt to maintain a healthy diet and take regular exercise. Cholesterol and other lipids are often high in kidney disease, this may require special medication. Is there anything else that I should do or not do? Avoid anti-inflammatory drugs (including some that can be bought without a prescription, such as ibuprofen) unless they are approved by a doctor who knows about your kidney problem. They can sometimes worsen kidney function in people with damaged kidneys. Eat a healthy diet, and follow the recommended special diet if you have one. Be sure to have your blood pressure checked regularly and to take treatment that is prescribed for it. Which patients with CKD should see a kidney specialist? Those with deteriorating kidney function. Those who are at high risk of losing kidney function. Young patients – have more years at risk. Older patients without high risk signs don’t. Those with advanced kidney function if dialysis might be necessary. High blood pressure (hypertension) and kidney disease. The book Kidney Failure Explained by A Stein and J Wild (Class Publishing) is good. Acknowledgements: The author of this page was Dr Morwenna Wood. It was first published in March 2000. The date is was last modified is shown in the footer. This page last modified on Jun 21, 2018 @ 12:43 pm.